Renesas and Integrated Device Technology confirmed that they received notification by the Committee on Foreign Investment in the United States (CFIUS) that the investigation of the companies’ proposed merger transaction is complete and that there are no unresolved national security concerns with respect to the transaction. The companies have already received antitrust clearance decisions from authorities in China, Germany, Hungary, and South Korea. IDT stockholders have previously voted to adopt the merger agreement and approve the transaction at a special meeting of stockholders held on January 15, 2019. The deal is expected to complete on March 29, 2019. Renesas Electronics Corporation of Japan has agreed to acquire Integrated Device Technology (IDT, NASDAQ: IDTI) for approximately US$6.7 billion (approximately 733.0 billion yen at an exchange rate of 110 yen to the dollar), combing two recognized leaders in embedded processors and analog mixed-signal semiconductors. IDT shares are to be acquired at a price of US$49.00 per share. 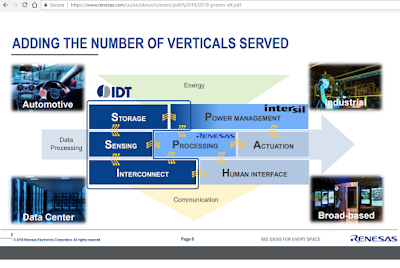 IDT, which is based in San Jose, California, is a leading supplier of analog mixed-signal products, including sensors, connectivity and wireless power. Renesas is the leading global supplier of microcontrollers, and a leader in analog & power and SoC products. 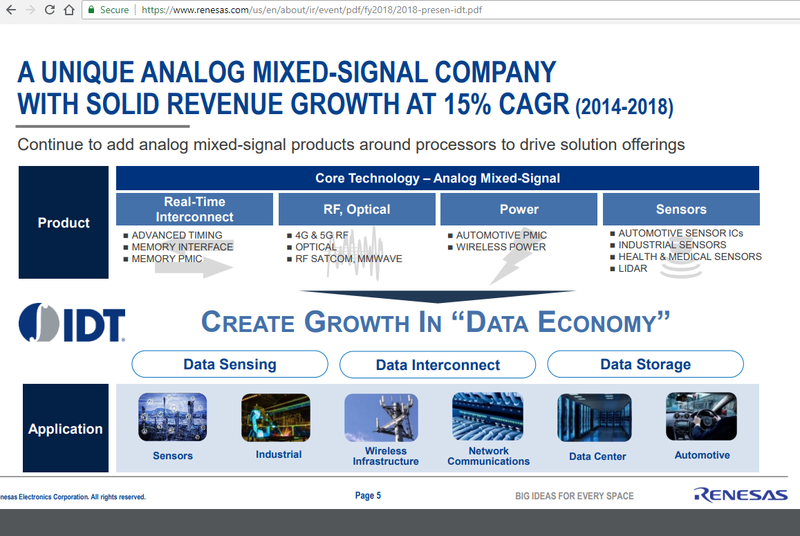 The acquisition will provide Renesas with analog mixed-signal capabilities in embedded systems, including RF, advanced timing, memory interface & power management, optical interconnect, wireless power, and smart sensors. The combination of these product lines with Renesas’ advanced MCUs and SoCs and power management ICs enables Renesas to offer comprehensive solutions that support the increasing demand of high data processing performance. Renesas said it is working to expand its analog solution lineup and to strengthen its kit solution offerings that combine its microcontrollers (MCUs), system-on-chips (SoCs) and analog products. The company's focus domains include: the automotive segment, which is expected to see tremendous growth with autonomous driving and EV/HEV; industrial and infrastructure segments, which are expected to advance with Industry 4.0 and 5G wireless communications, as well as the fast-growing IoT segment. Zayo has been selected leading cloud infrastructure provider to provide long-haul wavelengths connecting a new data center located on the West Coast. Zayo's solution includes multiple 100G wavelengths, with fully diverse connectivity, meeting the provider’s requirements for highly reliable capacity to support current and future growth. KT is deploying Ericsson to enable the nationwide launch of commercial 5G services in Korea starting early April 2019. Under this initial commercial contract – the first since Ericsson was selected as a 5G supplier to KT in November 2018 – Ericsson is providing 5G New Radio (NR) hardware and software from Ericsson’s complete 5G platform to cover KT’s 3.5 GHz Non-Standalone (NSA) network. Financial terms were not disclosed. In its S-1, Zoom disclosed annual revenue of $330 million for its fiscal year ended 31-Janauary-2019, up from $151 million the year before, and up from $61 million two years ago. The company was founded in 2011 and is headed by founder, President, and CEO Eric S. Yuan.